Kathleen Ryan is an Associate Professor in the Elementary Education Department. Doctor Ryan joined the Hellenic College Faculty in 2004 with a wide range of experience in the fields of Literature, Literacy, and Language Arts. 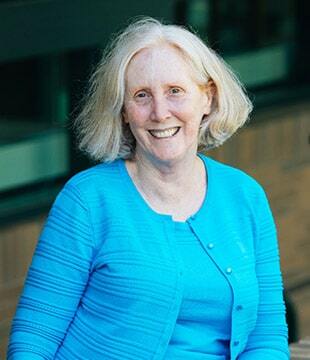 Dr. Kathleen Ryan’s focus in her doctoral program at University of Massachusetts Lowell centered on the power of literature to transform both academic lives and personal lives. Her doctoral dissertation, entitled Rediscovering Rosenblatt: Infusing the Teaching of Fiction with Louise Rosenblatt’s Theory of Aesthetic Reading, highlights the critical intersection of theory and practice. Doctor Ryan has presented her work at conferences throughout the state. Her presentations and publications focus on the importance of nurturing children’s and adolescents’ personal responses to literature. Her work at Hellenic College is shaped by a belief in the transformative power of teaching, learning, and literature. She is committed to empowering the Elementary Education students of Hellenic College as they strive to become exemplary teachers of the future. The classes she teaches include Children’s Literature, Philosophy of Education, Methods of Teaching Language Arts, and American Literature.